The Melbourne apartment market has remained robust. This comes despite negative sentiment surrounding the Victorian residential market and a high amount of supply activity. Victoria continues to lead the country in population growth, which has sustained dwelling demand and supported both prices and rental values, according to JLL Australia’s 2Q2018 Melbourne Apartment Market Commentary. Median apartment price growth continues to accelerate across Greater Melbourne, but some recent evidence suggests that momentum is stalling, says JLL Australia. 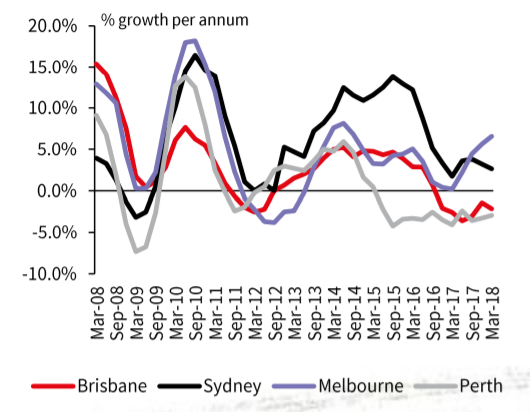 In quarterly data, the apartment price growth for Greater Melbourne (for both new and existing stock) increased 6.6% y-o-y to 1Q2018. This is above the five-year annual average rate of 4.5%. According to JLL Australia, the median apartment price now sits at AU$532,888 ($532,331). However, price growth has weakened in a number of inner-city suburbs. The strong growth for Greater Melbourne is likely being driven by attached dwellings in growth areas and historically high performing suburbs. Nevertheless, more timely measures such as Core Logic’s Monthly Hedonic Price series, suggests momentum has slowed in recent months. However, the market does appear to be holding better than Sydney. With inner city apartment completions likely to rise again next year, re-sales on new stock are likely to come under pressure. Rental demand remains strong in Melbourne, as vacancy tightens further and rental growth remains above average, says JLL Australia in its 2Q2018 report. Despite fears of oversupply in the rental market brought about by the high amount of recent apartment completions, rental growth has remained positive throughout Greater Melbourne.